I was lucky enough to be chosen as a delegate to the 2018 United State of Women Summit (USOW) with support from YWCA USA. As I sat through the speaking presentations at USOW, I was struck by the level of representation achieved in the room. Truly, any little girl could look up at the stage and recognize some version of herself. The first day’s program highlighted the contributions of Ibtihaj Muhammad, the first Muslim American woman to wear a hijab while competing for the US in the Olympics, Andrea Jenkins, the first openly transgender black woman elected to public office in the U.S., Ilhan Omar, the first Somali-American lawmaker in the country, as well as many other women with diversity of culture, race, class, and sexual orientation. Representation for young girls is so important. It shows them that they can be anything they can dream. A study done in India in 2012 found that girls growing up in villages with no female political leadership were 32% less likely to dream of continuing their education past primary school than their counterparts who grew up with strong female leaders [i]If our girls only see men, or white people, or cisgender people as leaders, then they might not be able to envision a world where they themselves run it all. The notorious Ruth Bader Ginsberg inspired my young self to believe that I, too, could be a force for change and mold the world I want to live in. I could see myself in her; a Jewish girl with brown hair and green eyes impassioned about the injustice I saw in the world. Now, it is up to us to be examples of everything that a girl can be. One of my favorite USOW quotes from my forever first lady, Michelle Obama, reads: “I think if we want our daughters to dream bigger than we did we have more work to do. So many of us have gotten ourselves to the table, but we’re still too grateful to be at the table. Holding onto our seats isn’t enough to help our girls. We have to shake things up.” Those women on the stage didn’t become aspirational role models without breaking down barriers. Every time there is a “first” to do something, it also implies that person will not be the last. It takes a strong woman willing to smash every glass ceiling and break down every barrier in her path to show young girls that they can be anything. First ladies and career idols are not the only ones who act as positive role models. Peer representation is really important. Girls who see other girls that are interested and successful in the things that they are interested in are more likely to envision themselves achieving success. My favorite part of the USOW program was the inclusion of our nation’s future change makers right next to its current ones. Yara Shahidi sat equally on a panel with Sen. Kamala Harris. Marley Dias and Marsai Martin had the honor of introducing Michelle Obama and Tracee Ellis Ross. Journey Jamison, Mei-Ling Ho-Shing and Tyah-Amoy Roberts earned a platform to talk about their work combatting gun violence. USOW demonstrated that young people have an important perspective and gave these inspiring young women of color an opportunity to make their voices heard. 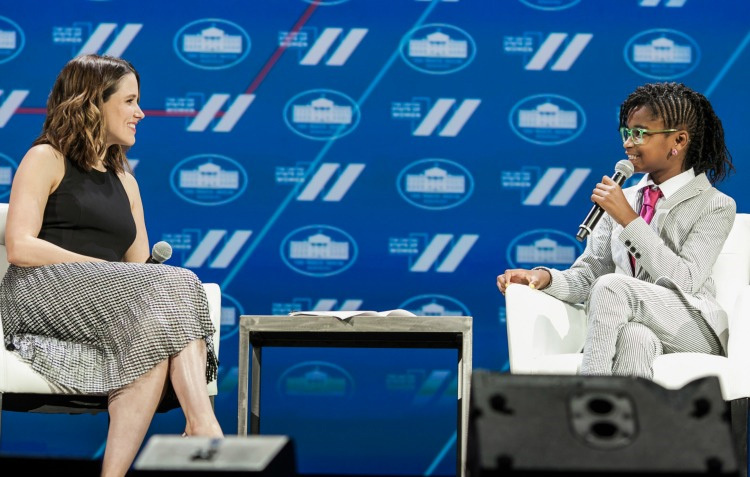 By putting these impactful voices on the stage, USOW inspired other young girls of color to follow Michelle Obama’s wise words and practice everyday who they want to be. As YWCA Dayton works to reimagine our Girls LEAD! program and explore new opportunities for women’s leadership, we will work to ensure representation at all levels of our community and to elevate the voices of young women and girls, so that all girls, no matter their race, class, religion or sexual orientation, believe that they can be anything. © 2019 YWCA USA, All Rights Reserved.